Many people choose to celebrate Bar and Bat Mitzvah in Israel. However, when Steven Budnick became Bar Mitzvah at Temple Isaiah this past July, he and his family chose to enhance this special year in Steven’s life by traveling to Israel with our Temple Isaiah group and having Steven read Torah again. Little did we all realize that this experience would be one of the most moving experiences for our entire group. The Friday before our group departed New York for Israel, Jill Weiss sent me an email. Jill is 35. She was born with a disability that makes her speech difficult for others to understand. This speech impediment prevented her from celebrating Bat Mitzvah at the age of 13. Now, at the age of 35, on the eve of embarking on our Israel journey, she wanted to know if it was possible to celebrate Bat Mitzvah in Israel. I assured her that we would make it happen. Before I discussed any details with her, I conferred with the Budnick family. I didn’t want to impinge on their celebration. I wanted to know how they would feel if we added the celebration of Jill’s Bat Mitzvah to the same morning that we were celebrating Steven’s re-dedication of his Bar Mitzvah. Before I could even get the words out of my mouth, they agreed. The B’nai Mitzvah celebration took place on Thursday morning, December 29th, after our group had already been together in Israel for over one week. It gave the group time to bond, form friendships and develop close connections to each other. Even though I am sharing the words that were spoken that day, they cannot truly convey the emotions that were felt by all who participated, by all who shared in the experience. Steven and Jill together created a common bond, bringing the group together in joy and gladness. We had laughed together over the previous week, become sick together, shed tears together, explored together, ate together, prayed together and now we would rejoice and celebrate not only with one another – but we would celebrate EACH other, we would lift each other up. We gathered together at 7:00 am for a short bus ride from our hotel in Jerusalem to the Dung Gate in the walls of the Old City. We were going to celebrate at Robinson’s Arch, in the egalitarian section of the southern side of the Western Wall. The platform was covered in a thin layer of ice, which Ofer (our tour guide) had to sweep away so we wouldn’t all slide off. But the sun was shining and the air was clear and crisp. It was quiet for awhile, until the rebel noise makers outside the wall above started blowing their shofarot and started banging their drums and playing their loud music. Their goal is to disrupt the egalitarian services which they know are taking place. Down by the Western Wall itself, the divided side, the Women of the Wall were gathering to celebrate Rosh Chodesh (the new month) and read Torah in celebration of Chanukah (we had been invited to join them, but the B’nai Mitzvah celebration took priority). Our friend Oren was in charge of a battalion of 250 + soldiers who had been called upon to protect the Women of the Wall and keep things “orderly.” He offered us protection to – in case we needed it. We assured him we’d be fine. I led a short morning service. And then both Steven and Jill carried the sefer Torah in the Hakafah. I would like to take this opportunity to thank everyone for joining my family and me during this momentous event. I chose to celebrate my Bar Mitzvah again in Israel because I feel a strong connection to my Jewish identity and the State of Israel. Israel is a nation rich in culture, language, history and diversity. My journey in Israel means so much to me because I will be reciting prayers at the place that is closest to God. Since my arrival in Israel, I have felt a reinforced sense of Judaism. My studies at Temple Isaiah provided me with the background knowledge of many biblical stories. Within the past few days I have seen firsthand the actual sights where some of these events occurred. Before I began this journey, I was doubtful of the validity of these stories. Now, I feel that I am a witness to the power of God and God’s followers. I can be Jewish in Israel without having to assimilate into Christian culture. Everywhere I look, I see Chanukiyot (Chanukah menorahs) and mezzuzot on each door. There are men dancing on the street and women and children singing Chanukah songs. I don’t feel like I’m a minority but part of a larger majority. I feel proud to be Jewish in a place dominated by others just like myself. In the United States, it is unusual to see Chanukah celebrated as such a popular and joyous holiday. My visits to the two Reform congregations make me feel connected to the people of Israel and God. Their struggle to prosper and uphold their Jewish values is important to me as a Reform Jew. We share the same songs, traditions and values. Even though we are separated by oceans and land, we are the same people. Our Jewish values and belief in God makes us one. The word “Chanukah” means “dedication.” It is especially symbolic that my Bar Mitzvah is during the holiday of Chanukah. Chanukah celebrates the dedication of the Temple in Jerusalem by the Maccabees. I can identify with Judah Maccabee and his strong will and bravery to overcome obstacles presented in his path. For me, I am dedicating myself to upholding the traditions and beliefs of my ancestors. I have continued my education at Temple Isaiah by attending Confirmation classes. I also am a youth group member of the Workman’s Circle. This organization’s goal is to work with individuals in the community who are in need of assistance. The Torah portion for this morning is from the book of Numbers. It is the reading for the 5th day of Chanukah. I am chanting Numbers 7, verses 36-41. Larry and I are so excited to be sharing Steven’s second Bar Mitzvah with our new extended family. It has been our dream to visit Jerusalem for many years. The last three years of our lives have been filled with many bumps and hurdles. It is during this time that we turned to prayer and reflection to deal with life challenges. We have renewed our faith in God and wanted our son to have the strongest connection to Judaism. Being in Israel has helped us realize the importance of being a Reform Jew. When we return to East Setuaket, we will continue the customs and traditions of Judaism. we understand how important our religion is to us. We hope to introduce the lighting of Shabbat candles into our Friday evening activities. Our family will also continue to attend services and celebrate the holidays with an increased joy and love. This trip has allowed us the opportunity to learn more about our culture and traditions. We truly feel we have come full circle to our homeland. At this time I am choosing to celebrate becoming Bat Mitzvah because, not only is it a right of passage for a Jewish girl, I want to be able to celebrate that right of passage myself. It is a tradition that both my brother Brian and sister Lauren celebrated when they were 13, but I was not given that same opportunity. I am choosing to do this in Israel because I am now more mature at the age of 35 and am more comfortable with myself. I saw this as an opportunity to make a commitment to my Jewish heritage. I am looking to feel more connected to my roots. On this trip to Israel, I discovered that Israel has a great history to be learned. It started as a small country and then turned into a beautiful great country which has given the world wonderful contributions. I feel I now have a better understanding of the Jewish religion. I know I still have so much more to learn, as I continue on the path of Jewish knowledge and commitment. Since I met Jill in 2001, she has always displayed passion, drive, and commitment for anything her heart desires. So of course her idea of becoming Bat Mitzvah was no exception to those intangible qualities. Although we are both Reform and don’t keep kosher in our apartment, Jill has shown me (and I hope you all see it too) that being Jewish is not always about how you practice, it but it is about who you are. So naturally, because she did not have a Bat Mitzvah twenty or so years ago…she figured why not do it in Israel. Her love for the history, culture, and new experiences prove that she is proud to be Jewish. I am very proud of her and excited to be here with her to celebrate this special moment with her. While we may not be with you “physically” on this most auspicious occasion, just know that we are with you in every other way possible – including spiritually, emotionally and LOVINGLY. We are proud of you – in more ways than you know. What a great idea (YOUR idea) to ask Rabbi Sharon Sobel if she could do this for you while in Israel (you wanted something symbolic and meaningful and, in your words, didn’t need a “shebang”) on the trip of a lifetime. Our thanks to her and to the Budnick family celebrating Steven’s Bar Mitzvah at this time and the other members of your travel group for sharing this with you. We literally could go on endlessly about how we all feel about you, how much we love you and how much we wish you nothing but happiness and good health for many, many years to come. No one deserves it more than you. You are amazing, bold, fearless and self-assured. A true modern woman. Enjoy this amazing experience…in the place where it all began. (And then I blessed Jill). The entire group held the Torah (or held onto someone who was holding the Torah as we recited our “Mi Sheberach” – our prayer for healing. We concluded our service, returned to the hotel for a celebratory breakfast. Lori and Howard Stern presented Steven and Jill with gifts and cards on behalf of the whole group (kudos to Lori and Howard for finding out what each of them truly wanted, traipsing about in the wind and rain, procuring the gifts on behalf of the group, wrapping them, etc). And then we continued on with the rest of our day’s activities. (That will be another blog post). Jill and Steven receiving their certificate from our tour guide, Ofer Zemach. Today was an unbelievable day for me. I had the opportunity to have a second Bar Mitzvah in Israel. After touring the country for over a week, I have such a strong connection to my Jewish roots. When I stood by the Wall and chanted my Torah portion, I felt so proud to be a Jew. I was standing at the holiest place beside the Torah and the Wall. I could see, hear and feel the generations of history that occurred at this site. When Rabbi Sobel touched my shoulders and offered me her blessings, I felt as if God was around me. The weather was sunny but cool. The sunshine and warmth of my Temple Isaiah friends made me feel so great. I especially thought it was fun to slide around [the ice on the ground when we first arrived in the morning] with the Torah by the Wall. There was no bima, seats or ark. Just the beautiful backdrop of the Wall. It was a spiritual and exciting experience today for me as a Bar Mitzvah. The most important things that I take away from my Bar Mitzvah today is that I have an important role as a Reform Jew. it is my obligation to practice the customs and traditions of Judaism. I also need to continue my Jewish studies and learn more about Israeli politics and policies. Thank you. I want to thank all of you for sharing with me the most amazing experience in my life today. I feel grateful for having a second family to celebrate this momentous occason with me. To become “Bat Mitzvah” for me means feeling complete. I know when a Jewish girl turns 13, she automanticly becomes “Bat Mitzvah.” But I wanted to be able to say the prayers and carry the Torah and rejoice in sharing with people I can call friends. I am the baby of my family and naturally I wanted to do and mirror what my siblings did when they turned 13. Growing up I’ve had difficulties as you can probably tell. My parents opted against me celebrating “Bat Mitzvah” publicly. I was disappointed but I understood. To become Bat Mitzvah here at the Wall is so special. I feel so close to my Jewish roots now. I was scared of Israel before I arrived here and felt that I would not be safe. But once I got here and realized that Israel is so like NYC, I realized that it is a wonderful and special country. I feel very safe. Again thank you all for sharing my special moment. For those of us sharing the experience, it was particularly poignant and moving. Steven was turning 14 the next day and he is so articulate, committed to Judaism and has a deep and abiding faith in God. He sets a wonderful example for each one of us. Most of all, both Steven and Jill embody the value of community and family. Our day was sweeter, more beautiful, more special because every single member of our group participated and celebrated with a full heart and joyful spirit. A little background about Ruby: both of her parents are Jewish educators. Her mother has been the Associate Camp Director at one of the Reform Movement’s summer camps for many years. Her father is an artist and is a teacher at a liberal Jewish Day School. Her maternal grandmother and step-grandfather are also Jewish educators. And they are all very involved in their local Reform congregation. Ruby has grown up with Jewish summer Camp as her second home, with the synagogue as her extended family and with her family encouraging her to pursue her passions. your youth will see visions. Ruby wrote her “Bucket List” in her notebook. 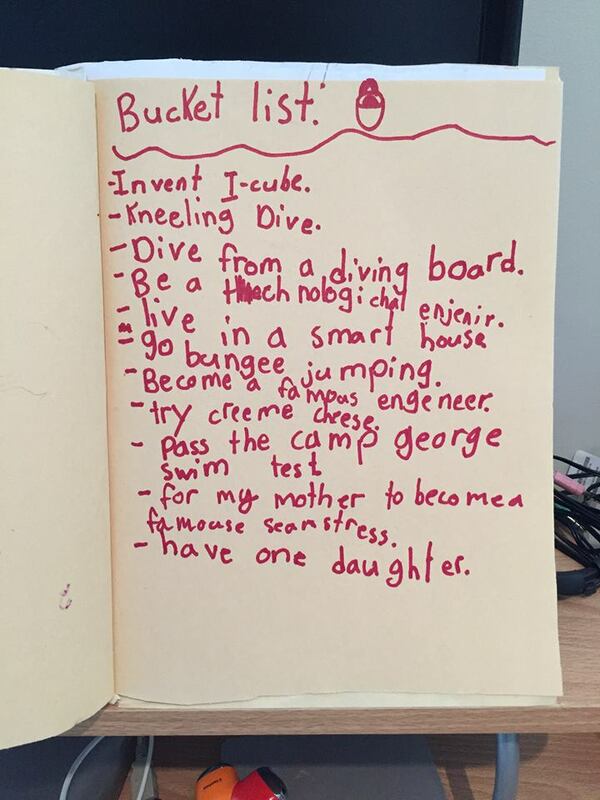 Three of the items on her list deal with her professional goals, which are quite lofty for an eight-year old: invent an I-Cube, become a technological engineer and become a famous engineer. Ruby loves science, computers and technology. She’s loves visiting the Ontario Science Center with her grandparents and parents. Her classmates always ask for her help with computer work. She figured out she can channel her passion into a professional goal and do what she loves for her vocation. This will lead to a life of contentment and fulfillment. You’ll notice that Ruby has “try creeme [sic] cheese” on her list. While Ruby loves bagels and lox, in her mother’s words, she “detests cream cheese.” Ruby understands that our tastes change. She also intuitively realizes that at times, it might take awhile for us to come to like something new. This applies to new foods, experiences and yes, even people. Just because you didn’t like something the first or even second time, it does not mean you won’t like it the third or fourth time. (You might still not like it, but you won’t know unless you try). What matters most is the effort one invests in trying. One of Ruby’s life goals is to live in a “smart house”. (I would expect nothing less from a famous technological engineer!) The best “smart houses” are also “Green Houses” which are the most ecologically and environmentally safe and friendly. We were given this earth to borrow while we are alive. We must bequeath it to the next generation – and all who come after them – in better condition than we found it. It’s incumbent upon us to take care of our world to the very best of our ability. find them a suitable spouse (so that they would never be alone and they can start their own family). Ruby’s goals involving swimming represent the notion of learning how to live safely in our world. There are so many areas of life where we can figure out how to “life safely”: diet, exercise, financial, internet security. We need to be prudent and thoughtful. Our life is a gift from God and we need to protect it. Ruby expresses a desire to have a daughter. Her parents and extended family encourage her individuality, her sense of inquisitiveness, her passion for learning. They spend time with her alone and time with her and her younger brother together. Ruby has learned to cherish the value of family. At the same time, she feels safe in the extended family of her Jewish community: her Jewish summer camp (where she can practice all of her different swimming/diving techniques), where she can celebrate Shabbat and the Holy Days and where she can express her own unique Jewish identity. Family and community make our lives richer, more fulfilling and more complete. With family and community by our side, anything is possible.